If the UK wants to secure favourable terms during the Brexit negotiations, it will be crucial to win the support of Germany. But what are the key German priorities as the talks move on to the second phase? Luuk Molthof writes that the 2015 Greek debt negotiations offer some insights into the German approach, and that the UK is likely to be disappointed if it believes Germany will put economic interests above its political support for European integration. A sigh of relief was heard on both sides of the channel when Jean-Claude Juncker announced on 8 December that ‘sufficient progress’ had been made in the first round of Brexit talks, opening the way for the second, and much more important, phase of the negotiations. Some commentators saw the breakthrough as a sign that the British government had finally acknowledged its place as the junior partner. Indeed, to be able to move on to the trade talks, Theresa May had given in to most of the EU’s demands. Yet the British government still seems fully confident that it will be able to negotiate a bespoke trade deal for itself. At the heart of this optimism is the assumption that some EU countries, such as Germany, the Netherlands, and Belgium, have a significant interest in good trading relations with the UK and won’t want to harm themselves economically merely to ‘punish’ Britain for leaving the EU. The British government seems to be particularly counting on Germany, the EU’s central power, whose export sector is seen as being much too dependent on the British economy for it to allow Britain to walk away without a deal. However, many German politics experts have warned the British government not to keep its hopes up. According to Charles Grant, “Germany’s top priority is to ensure that Brexit does not weaken the EU, and that means the UK must not be allowed any kind of special arrangements that could undermine the European institutions”. In a similar vein, Sophia Besch and Christian Odendahl point out that “politically, nothing is more important to Germany than the stability and integrity of the EU”. To understand why the British government would do well to heed these warnings, it is useful to be reminded of Germany’s role in the 2015 Greek bailout negotiations. The case is illustrative for two reasons. First, Germany’s decision back then to agree to a third bailout package for Greece, despite the apparent failings of the first two packages, is indicative of Berlin’s willingness to prioritise political over economic ends. Second, Germany’s refusal to soften Greece’s bailout conditions, even after repeated attempts by the Greek government to put pressure on Berlin, suggests that Germany is not one to soften its position at the behest of a junior negotiating partner. 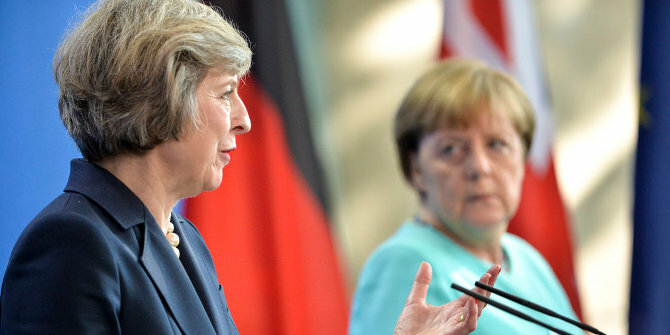 What the British government tends to forget is that for Germany, the EU is first and foremost a political project. In its efforts to further and safeguard European integration, Germany has often prioritised political over economic interests. So too in the summer of 2015, when Germany, alongside the other eurozone countries, agreed to extend a third bailout package to Greece. To be sure, over the course of the Greek debt negotiations, Germany never lost sight of its economic interests, refusing to grant Greece its much wanted Schuldenschnitt and remaining firm in its insistence on a strict reform programme. However, it always kept a larger perspective in mind. Greece had received two bailout packages before, the first in 2010 and the second in 2012. An important motivation for both bailouts was the concern over a potential domino effect in the case of a Greek default and/or exit from the eurozone. Another – at least in 2010 – was the exposure of German and French banks to Greek debt. In bailing out Greece, then, Germany and the other eurozone countries acted perfectly in line with their own economic interests. I have repeatedly said: If the euro fails, Europe fails. Some found and still find this too dramatic. But I remain insistent; for the euro is much more than just a currency. It is, next to the institutions that we have established, the strongest expression of our willingness to really unite the populations of Europe in prosperity and peace. Economically, it may well have made better sense to let Greece go. Yet in order to protect the euro’s role as a political instrument, Germany was willing to bear the economic costs. Similarly, Germany is likely to be willing to bear the economic costs of a no deal Brexit should that be necessary to protect the integrity of the internal market. Just like the British government is currently expecting the German government to eventually soften its position and give in to certain demands, so too did the Greek government expect the German government to eventually soften its austerity demands and perhaps even write off some debt. Greece found out the hard way, however, that Germany is not one to soften up when negotiating with a junior partner. Over the course of the 2015 debt negotiations, the Greek government made continued attempts to put pressure on Germany to adjust its position, using delaying tactics, insisting Germany still owed Greece compensation for WWII, and even calling a domestic referendum on the bailout conditions. All these attempts proved futile and in fact only strengthened Germany’s resilience. Only after Germany’s finance minister, Wolfgang Schäuble, started talking about the option of a temporary ‘timeout’ from the eurozone, did it dawn on the Greek government that it had vastly overestimated its negotiating position. In the end, the Greek government inevitably caved, accepting all of the conditions that had been so resoundingly rejected by the Greek population in the bailout referendum. The drawing out of the negotiations had been a costly affair for all involved, but primarily for Greece. The British government faces a similar suboptimal outcome should it fail to come to the realisation soon that it is indeed the junior negotiating partner, that time is really not on its side, and that empty threats to walk away from the negotiations without a deal aren’t likely to change anyone’s mind, least of all Germany’s. The fact that Germany is likely to prioritise its political interests over its economic interests in the Brexit negotiations, and is unlikely to give in to the demands of a junior negotiating partner, is not to say that Germany does not seek a good trading relationship with Britain. It is merely to say that it won’t agree to a type of deal that undermines the EU institutions simply because it doesn’t want to see a drop in Mercedes’ sales. Indeed, even the German industry itself has let it be known that the integrity of the internal market should not be sacrificed for access to the UK market. The British government would do well to keep this in mind and prepare a realistic vision for its post-Brexit relationship with the EU, instead of waiting for the Germans to lend them a helping hand. Luuk Molthof is a Research Fellow at d|part, a political think tank based in Berlin. He completed his PhD in Political Science at Royal Holloway, University of London. His thesis examined Germany’s role in European monetary history and provided an explanation for Germany’s reaction to the euro crisis.